After an invigorating drive in BMW’s all-new 328i sedan along challenging mountain roads, I was left wanting more. Yesterday’s escape into the Spanish countryside beyond the city of Barcelona showed BMW’s new 3 series’ performance in its natural element: twisty tarmac. BMW’s latest offering delivered with blistering pace both up and down the mountainside – minor brake fade notwithstanding. It was a hoot to drive fast and it proved playful the harder we pressed on. To more thoroughly analyze the dynamic abilities of BMW’s latest 3 series sedan, we turned it lose on Spain’s famous Formula 1 track: the Circuit de Catalunya. The overall dynamic picture is not so different from the one painted in our First Drive review (found here), in fact the car’s strengths were magnified on the high-speed track. 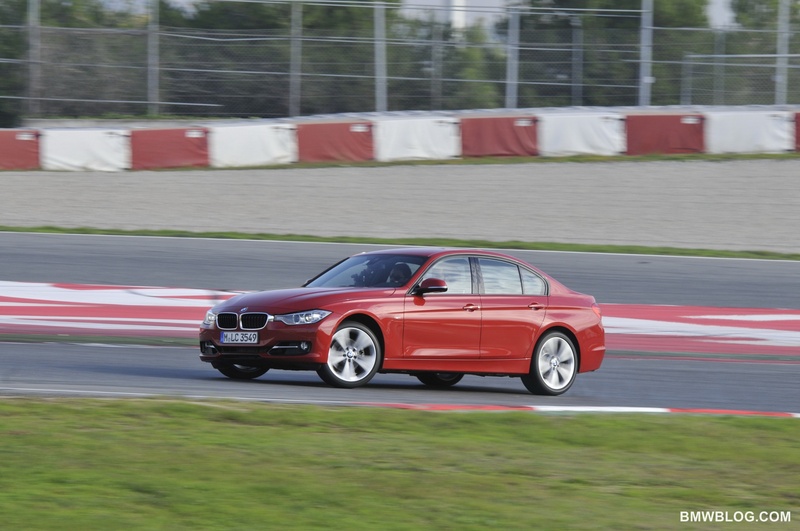 Read on to enjoy a lap of the Circuit de Catalunya in BMW’s latest 3 series. Turn 3 is a very wide radius 180 degree turn that wraps onto a back straight. This corner lays handling dynamics bare for all to see and severely punishes understeer. Thankfully, BMW did not tune too much understeer into the new 328i. As we found tearing along mountain roads, the car is willing to turn in and understeer can be mitigated with minor corrections to axle loading. Once we put a lot of heat in the front tires, the car began to understeer more with a loss of front end grip, but with a stickier set of rubber we are confident that the 328i would take on even more of a sports car personality. If you really want to push the new 328i to its limits it will respond well, in fact it likes to be driven with authority. Intentionally ‘throwing the car’ into a corner is rewarded with a lose rear end, and should you feel the urge, you can maintain a nice slip angle through the corner. The 328i is no drift car, but it can be drifted with a few techniques applied. I was pleasantly surprised on a few occasions as the 328i was also coaxed into a true power oversteer while pushing out from the apex – however a stickier set of tires would have all but eliminated this possibility. 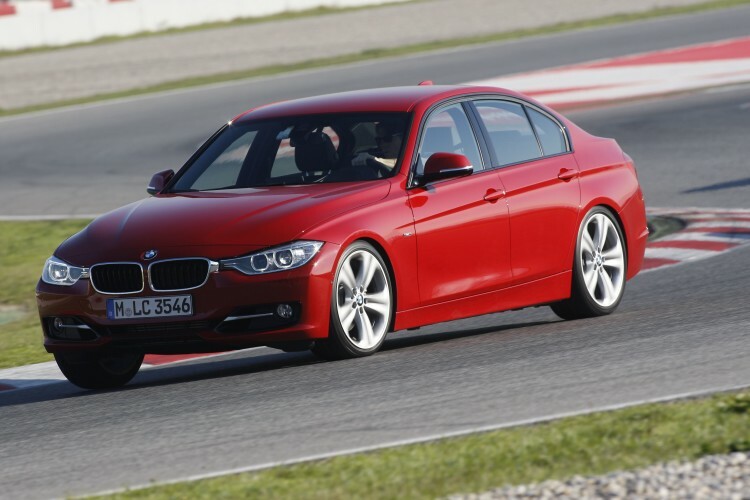 The chassis on the new F30 3 series is very stiff – a big step above the previous generation. This allows handling to be better optimized through the suspension, and it really shows. The composure of this 3 series is remarkable, and the fact it can transform itself from a cushy luxury car to a track worthy sports car at the push of a button is impressive. 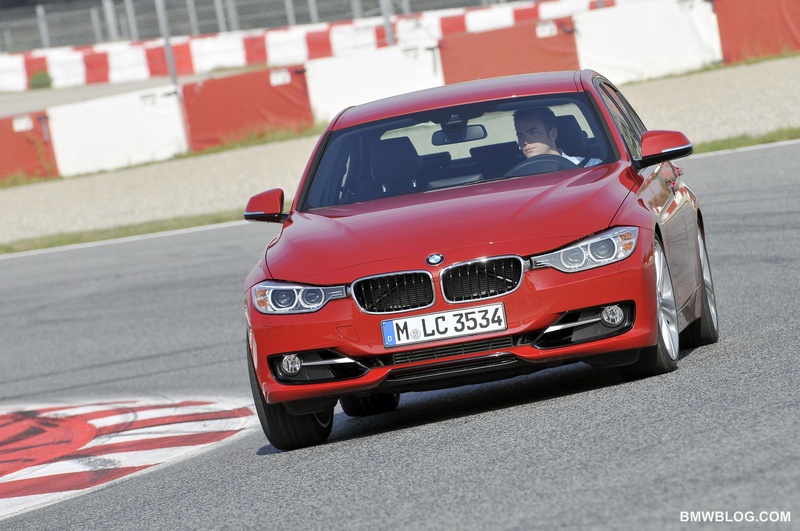 The acceleration from BMW’s new 328i is phenomenal. I cannot overstate how impressed I am with this engine’s power output. When I began pining for more power I reminded myself that this is a 2.0 liter! I have never felt such thrust from a small displacement engine, short of MINI’s JCW 1.6 liter and Motorrad’s 1.0 liter S1000RR engine – both sterling examples of the best the world has to offer, respectively. Gizmo trickery is the name of the game with many technological advancements playing their part. The single twin-scroll turbo crams air from very low rpm, allowing the engine to begin making peak torque at only 1,250 rpm. And there’s a lot of it: 260 lb-ft of twist sent to the rear wheels. An enhanced version of Valvetronic is responsible for engine throttling and it, in part, improves throttle response and immediacy. The new Valvetronic system is lighter, faster and more precise, according to BMW engine engineers on site at the racetrack. Centrally mounted direct injection delivers fuel in staggered bursts if necessary at up to 2,900 PSI (200 bar) – not only improving efficiency, but also cooling the engine upon injection, thus allowing higher compression ratios than possible without it. Thanks to the well balanced engine, the N20 can spin all the way up to 7,000 rpm and all without drama. In fact, this engine is very happy near redline where it produces peak horsepower output from 5,000 rpm to 6,500 rpm before the power band drops off toward the fuel cutoff. Peak power in the N20 sits at 245 hp and it feels every bit that powerful. Word through the grapevine states that an independent magazine has already had the N20 on the dyno, and it produced 230 hp at the wheels – meaning this engine has been underrated and actually produces closer to 265 hp at the crank. We love it when BMW lies to us. It will be interesting to see the truth of the matter once verified transparently on a dyno. 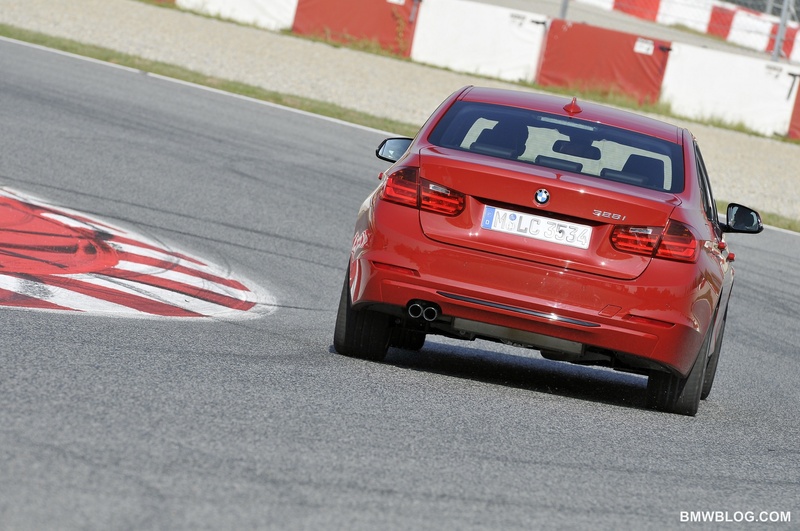 Now flying along it’s time for a heavy braking zone, and here the 328i sheds speed with haste – although after several hard laps moderate brake fade is felt, and the front rotors are billowing smoke. Perhaps I had a relatively fresh set of pads that hadn’t been fully broken in. The brakes feel positive and linear, they are easily modulated to precisely control the car on track. BMW’s ZF sourced 8-speed automatic made itself at home on the racetrack. I was blown away by its quick shifts and obedience to my commands. Of course, I would much prefer the manual transmission, particularly for track use, but the 8-speed did leave me deeply impressed. The transmission logic can now be locked out in manual mode such that the transmission will not upshift on its own as you bounce off the rev limiter. Just as God intended, the steering wheel mounted paddles are oriented: right for upshift and left for downshift. It’s worth mentioning that BMW aerodynamicists have gone a long way to reduce drag on the new 3 series – and this shows in the results. A very slippery drag coefficient of 0.26 Cd will not only add to efficiency, but also allow higher top speeds on track. The innovative air-curtain design first found on the 1M has now been applied to all new 3 series cars – sport model or otherwise – wherein air is routed from the front bumper out laterally in front of the front wheels so as to reduce turbulence and drag around the front wheels. Last but not least, steering feel was as expected based upon our First Drive experience in the neighboring mountains. 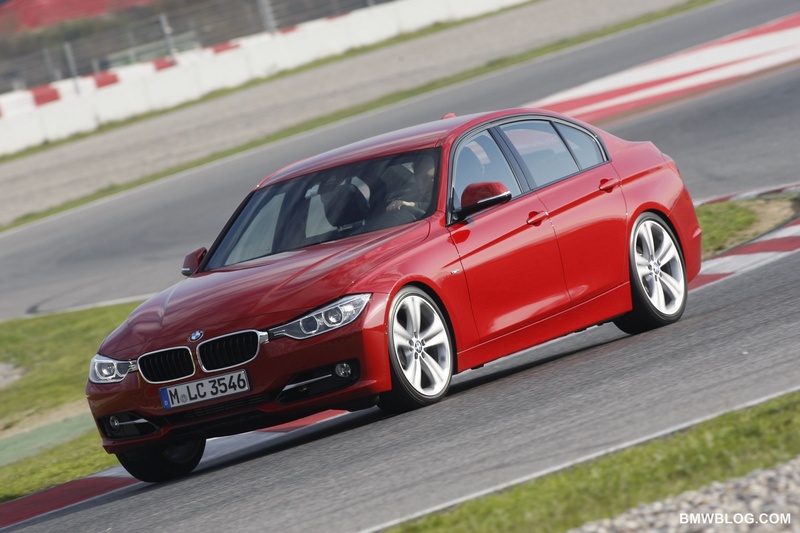 BMW has given the new 3 series just enough feel and feedback to get the job done, but nothing more. In no way is the steering feel a hinderance to performance, but I would appreciate a fuller picture being painted by the steering wheel. On a wet road or racetrack, this lack of feel and feedback would become more important, as the threshold before the tires lose grip would be more difficult to feel for. To the steering system’s credit, inputs are very precise in typical BMW fashion and the steering ratio adds to the sporty feel of the car. After several hard laps in BMW’s new 328i, I can only spill words of adoration. This is a tremendous car in every way – including dynamically – and most importantly it is fun to drive. BMW have maintained the secret recipe that stews 3 series cars to perfection through the decades, and the latest 3 series to leave Munich is no exception. I agree Kyle, it is a great looking car. it also shows well in red. Like most new BMWs, it looks best in person. ICE MAN is man back! Wondering how is he going to progress in the following season. Kimi has plenty of raw talent, he just doesn’t work hard enough to exploit it all of the time. I think he will do well with Lotus, he can probably manage top 10 next season and with some luck or other’s misfortune, maybe even get on the podium a couple times. When he was with McLaren he was one of the fastest in F1. I agree. We need to see the old kimi again when he was fast not like in is his final years at ferrari where he just seemed kind of bored. Shawn, great review and the new F30 looks nicely designed with a sporty stance in some of these track shots. I can’t wait to drive one!